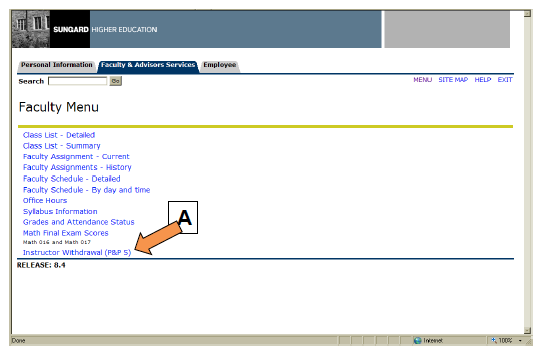 For credit/non-credit term information, log into the portal and click on the Faculty Menu. Faculty will submit attendance data (for credit and non-credit courses), instructor withdrawals, mid- term grades, and final grades (for credit and non-credit courses) using Banner Self Service for Faculty. The Office of Student Records and Registration shall be responsible to determine the time periods in which faculty will be able to submit attendance data and grades. When registration begins for a term, faculty may review their respective class rosters online using Banner Self Service for Faculty that is accessed via the MyCCP portal. You may print a class roster (Summary Class List) using the print function on your Web browser. The Summary Class List will only display students who are registered in the class. Students, who do not appear on your class list, should be directed to any of the registration counters for assistance. All faculty teaching credit and noncredit courses will receive email notifications to inform them when attendance and grade information may be entered. 1st notification – Sent one (1) day before the first day of the submission period for the part-of-term assigned to the course. faculty member has not submitted her/his attendance and grades by this date. 3rd notification – Sent one (1) day after the submission period ends if the faculty member has not submitted her/his attendance and grades by this date. 1st notification – Sent five (5) days before the 20% census date for the course. 2nd notification – Sent five (5) days before the last day of the 20% census period if the faculty member has not submitted her/his attendance by this date. 3rd notification – Sent the last day of the 20% census period if the faculty member has not submitted her/his attendance by this date. 4th notification – Sent the day after the 20% census period if the faculty member has not submitted her/his attendance by this date. These guidelines shall be used when recording attendance and grades on the 20% Mark Attendance Reports (formerly referred to as 3rd Week), the 50% Mark Attendance and Mid-Semester Grade Reports (formerly referred to as 7th Week), Final Grade Reports, and College Policies & Procedures Memorandum No. 5 Drops. A student’s name will appear on the attendance and grade report based on the course registration status code associated with the course (see Attachment C). Attendance must be entered for ALL students who appear on the report, even where the student has dropped the course. This is a financial aid requirement. For the 50% mark attendance and mid-term grade reporting, attendance information should be entered for ALL students. However, mid-term grades are not reported for students whose records indicate withdrawal. A student has regular and consistent class attendance. A student has neither been consistent in attendance based on College attendance policies, or has not met the faculty member’s class attendance guidelines. This category should be used if a student stopped attending during the term without explanation, if a student attended only one class session, or if a student dropped the course. Reminder: You must record the Last Date of Attendance for students in this category. NOTE: When a student is reported as having Unsatisfactory attendance, the student is not dropped from the course. The Office of Student Records and Registration is responsible for sending the student a written notification of her/his attendance status. If the faculty member determines that the student should be withdrawn from the course because of continued poor attendance, a College Policies & Procedures Memorandum No. 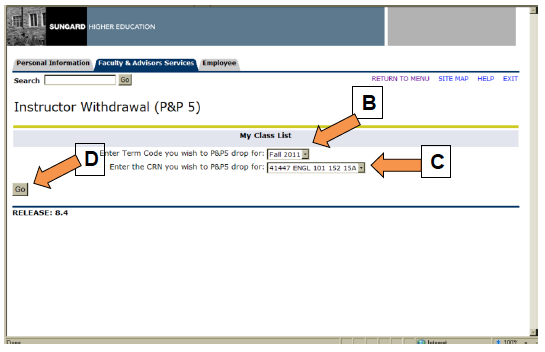 5 Drop should be processed via MyCCP from the Faculty and Advising Services Channel, Faculty Menu. A student is on the class roster who has never attended your section. The student has not participated in any class related activity. NOTE: When a student is reported as Never Attended, the Office of Student Records and Registration will run a process to drop the student from the course. The student will receive a written notification about her/his attendance status and the withdrawal from the course. The College is required to capture this information to be in compliance with federal financial aid regulations. The date must be recorded for any student who has stopped attending class. These guidelines shall be used when recording attendance on Noncredit Attendance Reports. A student appears on the attendance report who attended on the 20% date indicated on the report. A student attended before and after the 20% date, but not on the 20% date indicated on your report. 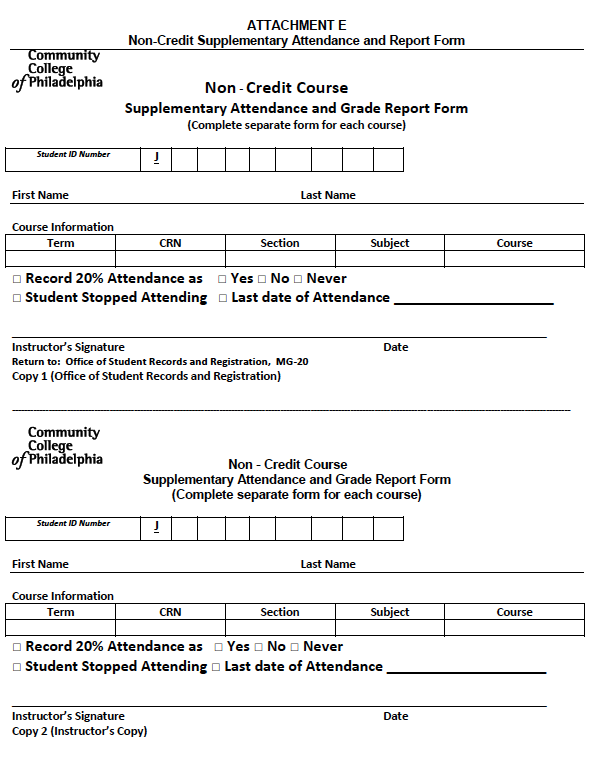 A student appears on the attendance report who attended only before or only after the 20% date and not on the 20% date indicated on your report. LAST DATE OF ATTENDANCE This information is not used in noncredit. A student who does not appear on your attendance or grade report is not officially enrolled. If a student is attending class and is not listed on an attendance and/or grade roster, the faculty member should have the student contact the Office of Student Records and Registration immediately to resolve the enrollment issue. If the student’s enrollment situation is satisfactorily resolved (i.e., student is now registered and paid) during the submission period, the faculty member will be contacted and given permission to record attendance or grade. 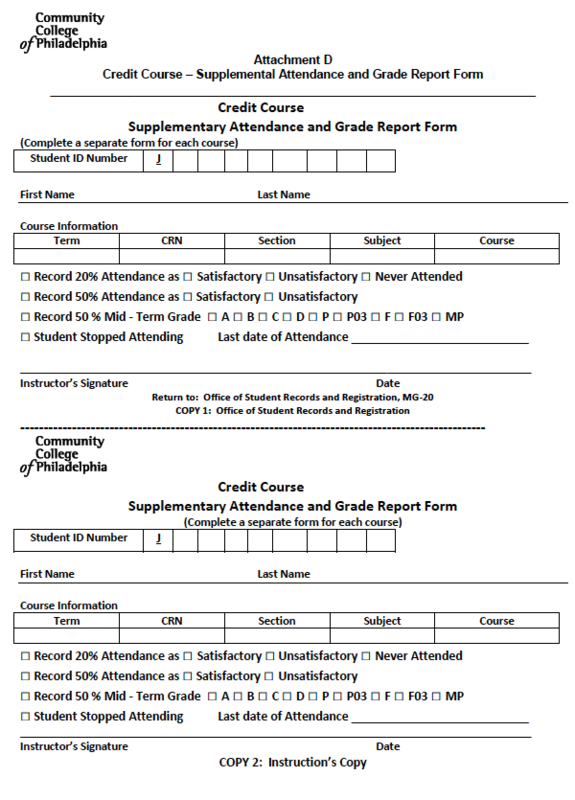 If the resolution occurs after the 20% attendance-reporting period or the 50% attendance and mid-term grade reporting submission period, the faculty member must complete a Supplementary Attendance and Grade Report Form. This form provides the Office of Student Records and Registration with documentation to enter the attendance and mid-term grade information in Internet Native Banner manually should the student’s situation be resolved at a later time. A copy of this form is attached (see Attachment D & E). You may obtain a form from the academic division office or from the Office of Student Records and Registration. Regarding final grade submissions, if the student’s enrollment situation is satisfactorily resolved during the submission period, the faculty member will be contacted and given permission to record the final grade. However, if resolution occurs after the final grade submission period, the faculty member will need to submit a Final Grade Change form. This form may be obtained from the academic division office. If the faculty member determines that a student should be removed from his/her class because of poor attendance, he/she may withdraw the student during the submission period (after the 20% attendance has been submitted, but before the last day of the 11th week of class, or its equivalent, via MyCCP, Faculty & Advising Services Channel, Faculty Menu, Instructor Withdrawal (P&P 5) link. (see Attachment F for detailed instructions). A withdrawn student will receive an email message notifying him/her of the processed withdrawal. If a student is withdrawn in error, the instructor must contact the Office of Student Records and Registration to reinstate the student. (email messages may be sent to for assistance. When a faculty member experiences difficulty while entering attendance and grades, she/he should determine if the problem is technical or operational. For example, a technical problem might be that you are unable to access MyCCP because of a network connection problem. In the case of a technical problem, contact the College’s Help Desk via email (4itsupport@ccp.edu) or via phone (215-496-6000). If you believe the problem you are experiencing is operational, you should contact your respective department head. An example of an operational problem might be that you are in Banner Self Service but cannot access the attendance or grade report worksheet for your course. In this example, before you contact the department head, you may want to verify the start and end dates of the submission period for the course. You may not be able to access the worksheet because you are trying to do so before the submission period starts or after the submission period has ended. The late submission of attendance and/or grade information has detrimental consequences for students as well as the College. For some students, the reporting of attendance directly impacts the timely processing and receipt of financial aid balance checks. For the College, timely reporting is essential to meet state and federal requirements. Once the online attendance and/or grade submission period has ended, the Faculty Course Attendance Worksheet will no longer be available. Therefore, after each submission period has ended, the Office of Student Records and Registration will provide copies of Late Attendance and Grade Rosters to each academic division office supervisor. The Office of Student Records and Registration will run a report for missing attendance and grade reports after the submission deadline to monitor which attendance and grade reports are outstanding. Late submissions will be reported to the Division Deans and Department Heads. To report late submissions, the faculty member must follow these steps. Obtain a copy of the Late Attendance and Grade Roster from the division office supervisor. In black or blue ink, record attendance and/or grade information for all students. Refer to Guidelines for Proper Credit Attendance Reporting or Guidelines for Proper Non-Credit Attendance Reporting. NOTE: Attendance information must be recorded for all students including those students who are dropped. Sign and date the Late Attendance and Grade Roster. Submit the Late Attendance and Grade Roster to the Department Head for signature and date. The Department office should maintain a file copy and submit the original copy to the Office of Student Records and Registration, located in Room MG-20. Attendance and mid-term grades are not maintained permanently on a student’s record. This information is recorded and held in temporary files. However, final grades are permanent information that become part of the student’s academic record. The “roll” process (done in the Office of Student Records and Registration) posts final grades to the student’s academic history record. The final grade is then available to the student via MyCCP. 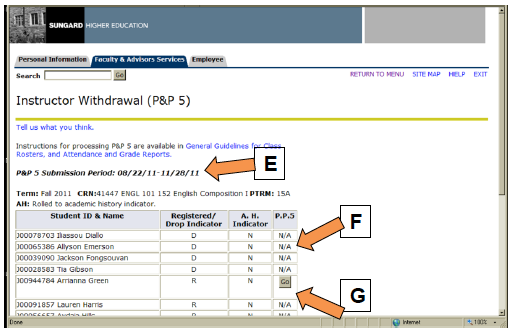 Once grades are rolled they cannot be changed via the Web by faculty. After the roll process, any grade change for a student must be handled by submitting a Final Grade Change form. The Office of Student Records and Registration will turn on the indicator to display mid-term and final grades on the day after the submission period ends for part-of-term 15A for Fall and Spring Terms and part-of-term 7A for Summer Terms. After attendance and grade data have been reported, the Office of Student Records and Registration will run the necessary Banner process for all CRNs and save a copy as a file to the College’s data warehouse archives where authorized College staff as well as internal and external auditors may retrieve this data. You will have between [Start Date] and [End date] to enter this information. Information may be entered until the last day of the submission period until 11:59 PM. Please refer to the "General Guidelines for Class Rosters, and Attendance and Grade Reports" for details about the attendance and grade reporting process, which you may wish to print and keep as a reference. For 20% Attendance Reporting: Attendance must be entered for ALL students on your class roster. For 50% Attendance and Mid-term Grade Reporting: Attendance information should be entered for ALL students. However, mid-term grades are not reported for students whose records indicate withdrawal. Not reporting attendance may jeopardize a student’s financial aid and prevent him/her from registering for the subsequent semester. Once financial aid is rescinded it takes a number of weeks for it to be reinstated. For Final Grade Reporting: Grades must be entered for ALL students who appear on the report. If a student should not be on the report, contact the Office of Student Records and Registration before [End Date] to resolve the matter. The Office can be contacted by email at or by phone at 215-751-8262. If you experience difficulty entering your attendance or grade information, please refer to the "General Guidelines for Class Rosters, and Attendance and Grade Reports" document for help. This email is to inform you that your [20 Pct Mark Attendance, MidTerm/50 Pct Mark Attendance, Final Grades] for the course indicated below has not been recorded. [End date] is the last day to enter attendance and/or grades online for this course. Failure to do so will result in your attendance or grade information being late. Information may be entered until midnight [End Date] for the part-of-term for this course. For 20% Attendance Reporting: Attendance must be entered for ALL students on your class roster. The Office of Financial Aid cannot process balance checks for any student whose attendance is not reported. Late submission of 20% attendance will result in a student not getting her/his balance check in a timely manner. For Final Grade Reporting: Grades must be entered for ALL students who appear on the report. If a student should not be on the report, contact the Office of Student Records and Registration before [End date] to resolve the matter. The Office can be contacted by email at or by phone at 215-751-8262. Late grade reporting will affect students who need official transcripts sent to other institutions or tuition reimbursement from an employer. If this notice is for the 20% attendance-reporting period, late attendance reporting will delay financial aid balance check disbursement for those students on financial aid. If this notice is for final grade reporting, late grade reporting will affect students who need official transcripts sent to other institutions or tuition reimbursement from an employer. Your attendance report for [SUBJ CRSE SEQ TITLE] will be available on [DATE1]. You only have until [DATE2] to complete this information on-line. The Pennsylvania Department of Education requires community colleges to maintain attendance records for audit review each year. Institutional guidelines can be found on the Faculty menu for Banner Self-service under the Attendance and Grading link. Thank you in advance for your expedient response. This email is to inform you that your attendance has not been recorded to date for the [CRN] mentioned below. There are only 5 days left to enter attendance for this course. Your attendance must be entered before [DATE2]. Today is the last day to enter attendance on-line. Failure to do so will result in your attendance being late and notification sent to the Dean or Department Head. Attendance MUST be entered today. This email is to inform you that the time to enter your attendance on-line has expired. The dean and/or Department Head have been notified. In order to comply, you must follow the late submission procedures in the College’s Guidelines. The following table indicates (X) when a student’s record will display for recording attendance and grades based on the course registration status code associated with the course. Instructor Withdrawal (P&P 5) is available in the Faculty Menu. Click on the Instructor Withdrawal (P&P 5) link. Each section has its own submission period. Attendance must be reported for the CRN before the process can be used to remove students from the class roster. 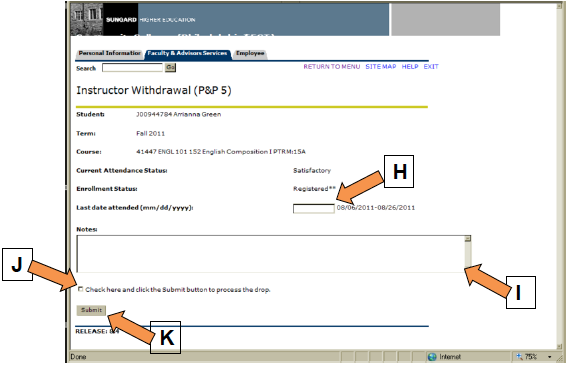 If a student does not qualify for an Instructor Withdrawal (P & P 5), N/A will display in the row. 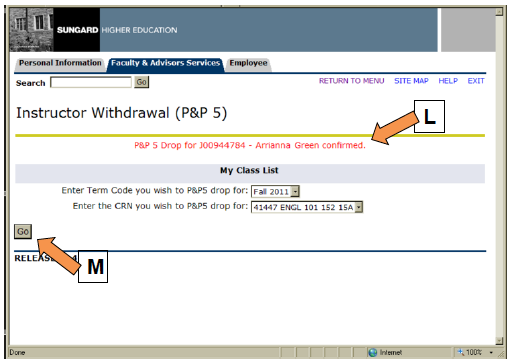 If a student qualifies for an Instructor Withdrawal (P & P 5), a GO button will display in the row. Click on the GO button to process the drop for the student. Enter the last date of attendance. Valid date range is listed next to the textbox. Last date of attendance is required. Enter optional notes related to the withdrawal. Click on the CHECK box to confirm. Click on the SUBMIT button complete the drop. If you have any questions regarding this process please contact Bonnie Harrington, Director of the Office of Student Records and Registration (215) 496-6070.